Gears of Halo - Video game reviews, news and cosplay : Remember ODST? In preparation for the release, I've been reflecting on the previous Halo games - here's my thoughts on re runs of Halo 3 and CE. Below is my first impression of ODST, I think my comments are still the same a year later. What do you think? I do love how this game had 'Remember Reach' graffitied on the walls through out the game and that is now a phrase being used to promote Halo Reach. An interesting opening scene falls way to a very dull start. Walk around Mombassa, find a few things, shoot a few things. 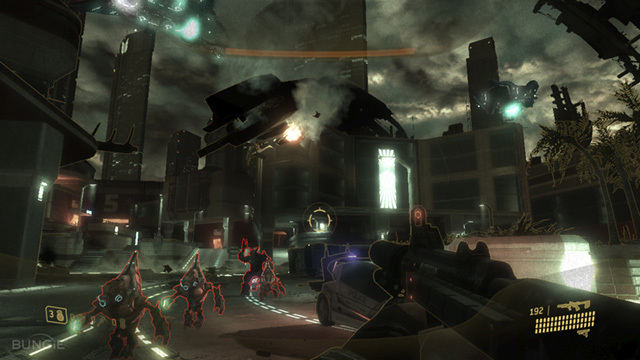 The real action of ODST is the vignettes where the Rookie (you) gets to play in the scenes where the Rookie is piecing together traces what has gone on in the past 6 hours. Bungie step up big time in this regard and deliver some remarkably fun set pieces to play. Blowing up bridges, heavy defence scenarios, sniping, strange looking creatures and decent enemy AI means some seriously fun engagments. I did however find wandering through Mombassa slow going and quite dull at times. If I had to call fault on one thing, it's how Bungie consistently fail to present decent face detail for their human characters in the Halo series. The plot evolves around a secret mission that is foisted on the Rookie and his team. It's not explained till the very end why everything is happening and its hardly anything to write home about but it's nice in its own way. A small payoff at the cut scene following the credit roll will make some fans happy. P.S. Did anyone figurewhat whvidldshbyjsdo is in reference to yet?